Carel Pieter Brest van Kempen is a Utah native who grew up in Emigration Canyon, but his name invokes the Northern Renaissance: the great scientific and artistic era when Carel Fabritius painted “The Goldfinch,” an ornithological study celebrated in a 2013 Pulitzer Prize-winning novel; and Pieter Bruegel the Elder painted “Landscape with the Fall of Icarus,” subject of one of the most influential modern poems, W.H. Auden’s “Musée des Beaux Arts.” But it’s also vital here to include Anton van Leeuwenhoek, whose microscope stands as an essential contribution to the history of science. For, in the paintings of Brest van Kempen, neither science nor art yields primacy to the other. Instead, they collaborate to show how much more each can accomplish in tandem, and how a holistic approach can exceed the limits imposed by narrow perspectives. Brest van Kempen depicts individual examples or small populations from the almost infinite variety of living things, showing them within the environments that, as Darwin taught us to see, passively determine their limitlessly variable forms and structures. That he does this utilizing techniques that predate instantaneous photography should make him an anachronism of sorts. Why would anyone paint the way he does, and why should anyone go in search of a rare opportunity to see his work locally, like that currently being provided by Michael Berry Gallery and Frameshop? A partial answer lies in the way the paintings of Brest van Kempen, which by rights ought to be superfluous, instead arrive at a historical moment when they couldn’t be more relevant. This could be because in the 21st century, the mainstream having dried up, genres have begun to feed into and nourish culture. Think science fiction, romantic comedy . . . zombies. Think images of alienated and endangered nature. We may well ask what more important work there is for an artist than to elevate these genre subjects, mostly made to wallow in kitsch, and thereby take advantage of their recent, relatively sudden vogue. There is, in fact, a movement among artists to capture and celebrate not just nature, but the parts of it that escape that aesthetic equivalent of taming and gentrification. Not only do these artists record the threatened natural world, including species that are disappearing as quickly as paint dries, but they demonstrate the survival of the threatened human ability to convert three-dimensional reality into brilliant two-dimensional patterns of light, shade, and color. A rare appearance of these stunning originals by an almost necessarily self-taught artist is a chance not only to connect with previously unseen nature, but to reconnect with the still-real distinction between an image that shares its scale with the observer—some of his paintings span a literal 6 feet in the originals—and the dubious copy that could be any size, any resolution from thumbnail, to mall mural, to billboard with a pixel size larger than many of the plants and animals that fill these paintings. Like his subjects in nature, Brest van Kempen’s paintings defy enumeration. Two examples show what he contributes to the catalog of life’s variety. 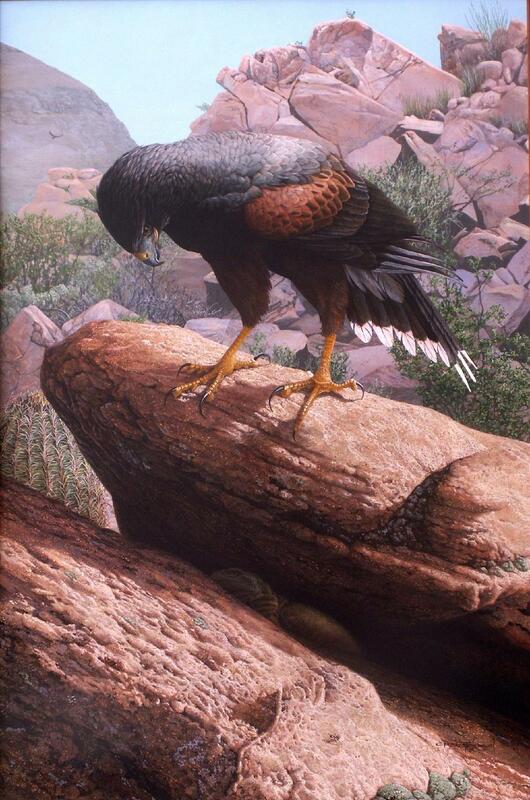 “Harris Hawk and Common Chuckwalla” (2006) is dominated by the bird, its posture as accurately portrayed as its plumage and the meticulously realized desert environment that constitutes its biological niche. But that forcefulness becomes an analogy for the way the predator dominates the whole world of the potential meal it has cornered. In the thumbnail, the lizard is a patch of light in the crevice of stone, but in the painting, for those fortunate enough to see it at Michael Berry, the chuckwalla, with its gimlet eye staring back at those of its hunter, is an equal protagonist in this rare image that for once accurately acknowledges both participants in the drama. And when his audience has caught on to the way he tells the truth—not his subjective opinion, but as close as he can come to objective truth—Brest van Kempen offers a challenge to eyes trying not to grow fat and lazy on the easy eye candy of CGI-based movies and TV. In “Riparian Rashomon” (2009), two perspectives on this essential drama share a frame. 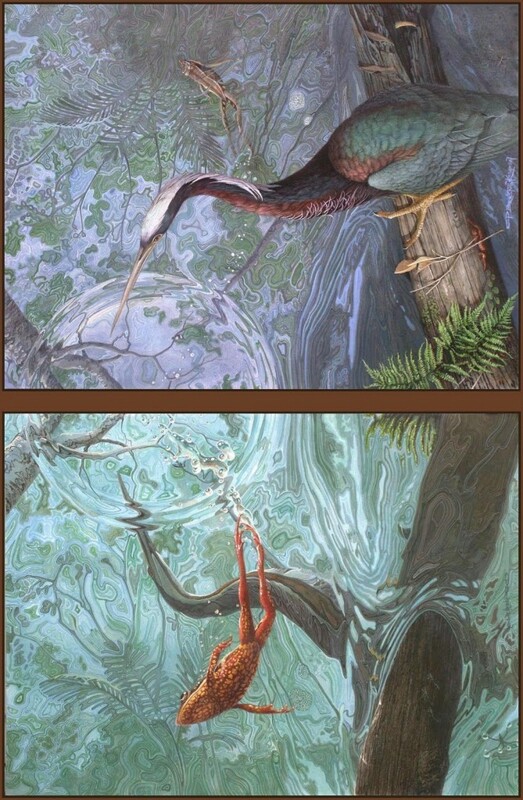 In one, the viewer has the aerial perspective of the heron, just as happens in both their lives. But in the other, the viewer’s dry eye is transported into the aqueous world of the frog, where everything visible before is seen as if for the first time. It’s just one example of many wherein the painter vividly opens up scientific knowledge and makes dramatic, lived experience from it. In spite of nature documentaries in every medium, there is still a role for human minds, and especially those allied with brilliantly talented hands, to intervene in the search to reach out and touch our actual home. “Inspired by the Natural World: Paintings and Drawings by Carel Pieter Brest van Kempen,” Michael Berry Gallery and Frameshop (163 E. 300 South, Salt Lake City), Oct. 21-Jan. 20, 2017. Gallery Stroll Reception on Oct. 21, 6-9 p.m.